The Central York school board unanimously approved Josh Oswalt, 29, as its head football coach Monday night. The move comes a little more than three months after Central fired longtime coach Brad Livingston. 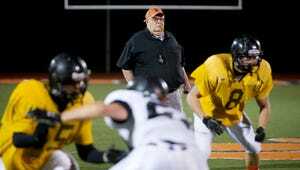 Livingston, 67, coached in the football program for 46 consecutive seasons, including the last 34 as a head coach. He compiled a 211-153-4 career record, but Central's administration asked him to resign after a losing season in November. When Livingston, a retired teacher, refused to step down, Central fired him. "I don't anticipate having any problems," Oswalt said about taking over a program following the administration's decision to fire Livingston. "I was not part of the former staff, but I don't anticipate taking flak for taking an interview or accepting the position. It was an appealing position." Central York Supt. Michael Snell declined to comment on Oswalt's hiring, directing all inquiries to an office number for Julie Romig, Central York School District's director of communications and marketing. Oswalt, who arrives in Central after helping rebuild Carlisle's program, said he pursued the Central York job because he thinks the school has a lot of the pieces needed to become a regional powerhouse. "I just look at Central York, as do a lot of football minds, as a place that has so much potential," Oswalt said. "I look at it as a place that could rival Cumberland Valley." A sixth-grade teacher at Wilson Middle School in Carlisle School District, Oswalt has applied for multiple teaching positions at Central York. He and his wife live in Mechanicsburg, but he is certified to teach kindergarten through 12th grade, and he would prefer to work at the high school level. Oswalt is still searching for his first winning season. He went 18-46 in six seasons at Carlisle, including two consecutive playoff appearances in the District 3 tournament. But he did not walk into a good situation. Oswalt became the Carlisle head coach at age 24 in 2010, leading the Thundering Herd after spending just one year as a graduate assistant under then-Shippensburg University head coach Rockey Rees. Carlisle had won just six games during the four-year stretch before he arrived. He was the 10th individual offered the job, and the first to accept the position, Carlisle Supt. Mary Kay Durham told PennLive in 2010. The Class AAAA school attracted about 40 players in his first season, but the varsity roster dipped to 27 dressed players for one game before the program's numbers started to improve. "Before I took the job I said, this could be a five to seven year process before it gets going again," Oswalt said. Familiar with the wing-T before arriving at Carlisle, Oswalt ran a spread offense during his last two seasons at Carlisle. Junior Eric Harris led the state with 3,635 yards passing this season, and the year before, Billy Burger established the school record for career passing yards before going to play at Dickinson College. In 2014, Carlisle returned to the District 3 playoffs for the first time in nine seasons, posting a 5-5 regular-season mark and earning the final spot in the bracket before losing to No.-1 ranked Wilson. This season, the Herd recorded the same record and spot in the district playoffs before losing to No.-1 ranked Central Dauphin, 59-39. Oswalt also trumpeted an increase in participation in Carlisle on a Facebook post from June 2015, noting the Herd had 94 players fitted for helmets, including 37 freshman. He said it was the highest number he's had at Carlisle and the program's highest-number of players since 2008. The program ultimately had 97 players this season. "Recruiting (students in the school district to play) is one of my stronger characteristics," Oswalt said. Oswalt is a 2004 Cumberland Valley graduate, playing under now-retired coach Tim Rimpfel — a member of the 300-win club. He earned All-Mid Penn Conference First Team honors and Mid Penn Conference Defensive Player honors as a senior.